As the temperature dropped into the 30’s and 40’s in the morning, Debbie’s enthusiasm for getting out on the tandem 3 times a week for 35-mile loop rides from the house quickly faded. She’s more or less uninterested in riding unless the temps are above 60, or in the 50’s with the sun warmth in full effect. Therefore, this change in my retirement cycling regime required an adjustment on my part. So, it was on this past Monday afternoon that I took my Dean Scout, hardtail mountain bike over to the local trails for a nice 10-mile ride. It felt really good to be back on the trails. Sadly, a significant portion of the local trails (Areas A, E & D on the map at right) will close on 1 November through 31 December for bow hunting season. 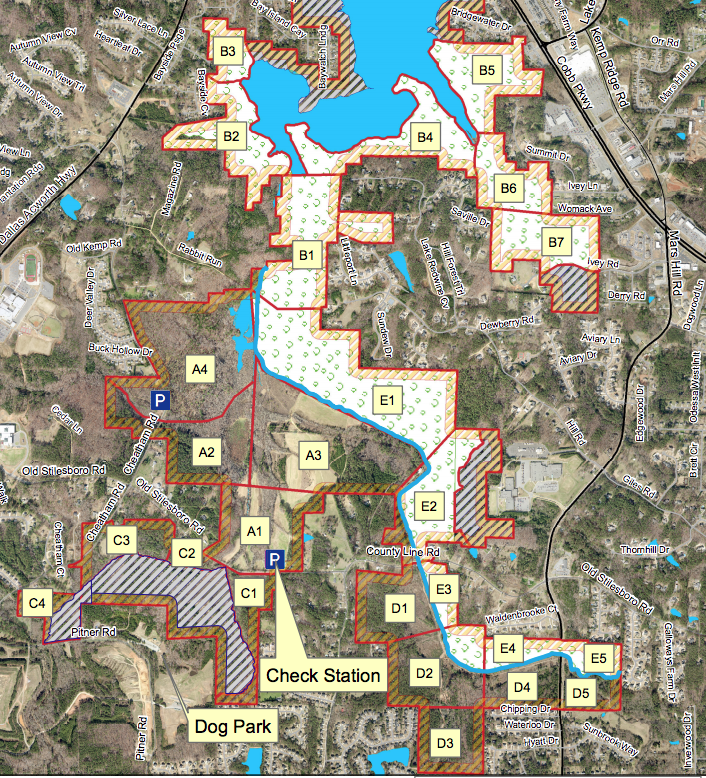 Thankfully, they’ve adjusted the trail closings a bit over the past two years such that one set of loops located in the “C” areas bordered by subdivisions are off-limits to hunters and open for cycling, hikers, runners, etc. So, I will definitely be taking advantage of those trails during November and December as time and weather permit. 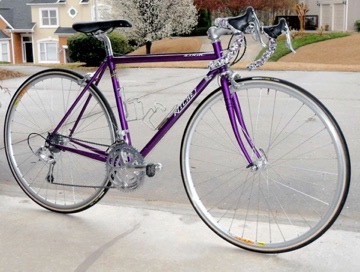 And, I’ll also be heading out on my single road bike and, when we get those occasional sunny 50°F days you can bet that I’ll be checking to see if Debbie is up for a tandem ride. Anyway, during my ride on Monday I realized my late 1990’s Dean mountain bike needed some mechanical attention as the rear wheel was a bit out of true and I also realized the tubeless tire never full-seated on the tubeless tire rim, noting that I’m using them with tubes: yes, I’m a cycling troglodyte. It was also a filthy mess after several rides and in need of a wash. It didn’t take me too long to attend to those things and it gave me the motivation I needed to clean our tandem, which was still carrying a lot of road grime from our 120 miles of riding in Florida, my Ventana F/S mountain bike and my Calfee road bike… all of which were quite dirty. I used to be really good about keeping all of my bicycle’s spotless; hmmm. Maybe I have shifted too far to the other end of periodic maintenance. After getting the bikes I ride most often cleaned-up I was definitely back in the bicycle mechanic groove. This was a good thing as I was way behind on a few things, like rebuilding a broken Campy Chorus shifter that came off of Debbie’s Calfee single bike over a year ago. My quick fix for her bike was to use a spare Campy Record shifter. Her broken shifter and the replacement parts for it have been sitting on my workbench but without a pressing need to fix the thing I’ve just let it sit. So, on Tuesday morning the rebuild went really well and the Campy Record shifter went back into the box with the left-hand shifter for future use. I should switch it back out with the one on her Calfee, but I know she won’t like the very stiff shifter movement that comes right after a rebuild so at some point I’ll get it switched-out. With that rebuild out of the way I remembered that my Dean single bike sitting on the stationary trainer upstairs in the exercise room adjacent to our master suite also had a Campy shifter with worn springs that needed to be replaced. So, I brought that bike down to the garage and started working on it Tuesday afternoon. I was moving right along until I went to re-assemble the shifter and ran into problems with one of the springs. I’m not sure why the little return spring (item F in the photo above) just didn’t want to compress the way it should have, but after fighting with it for well over an hour — it should have taken 2 minutes — I gave up and ordered a new one. Good grief, $8.00 for a little spring that probably cost $.05 to make. Oh well, when you must have it, you must have it. So, the bike would just sit in the work stand until the parts arrive sometime next week. I found myself on something of a roll and with the Dean project now stalled I was eager to take on something else bicycle related. 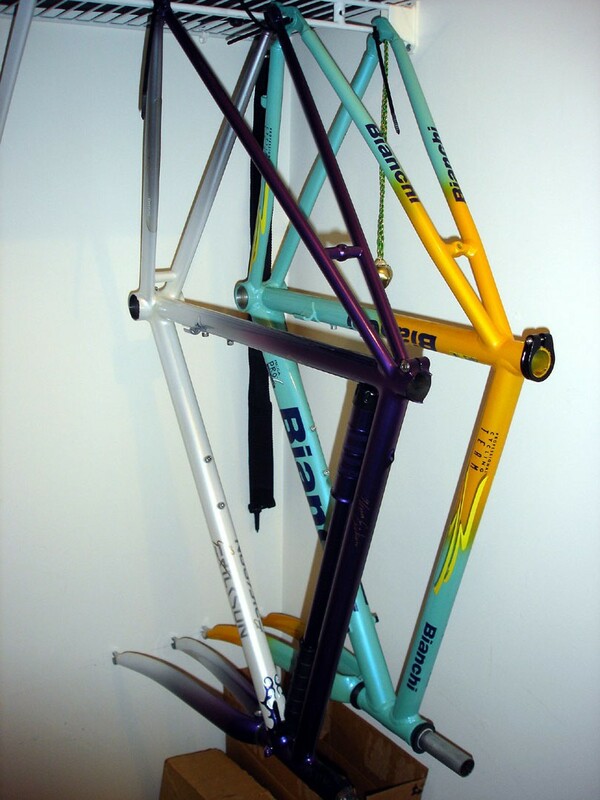 I’d thought about building up a 1998 Bianchi Mega Exo / Team Mercatone Uno Tour de France replica frame that I’ve had hanging in a closet for well over a decade. 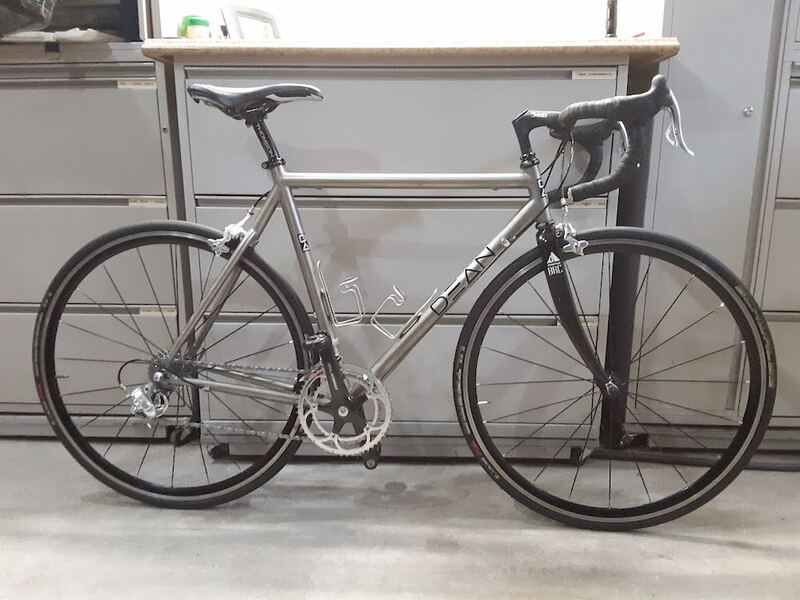 But, I really didn’t want to spend a lot of money building up a set of wheels for it as that was the one thing I didn’t have sitting around with the right hubs as I probably would ride it once and then it would sit for another 10 years. 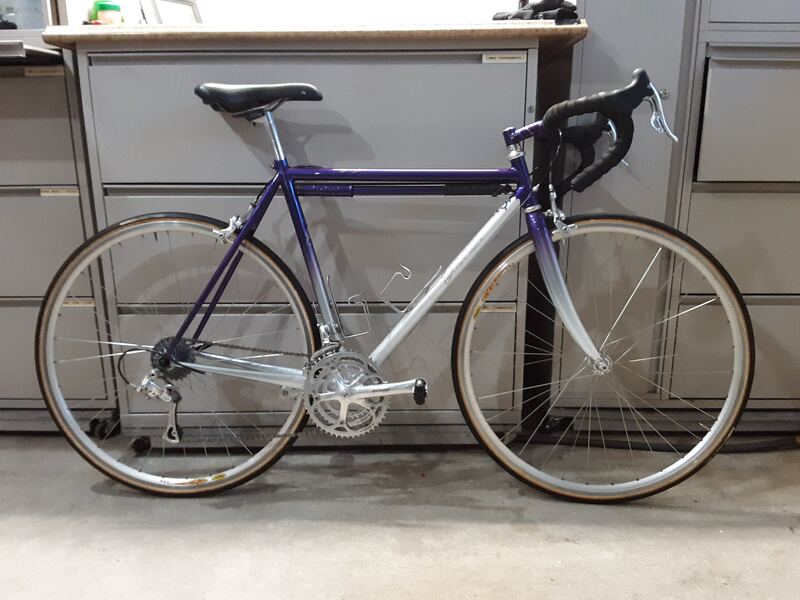 After all, I had the aforementioned Dean road bike sitting upstairs getting very little use and my purple and white 1999 Erickson that still needed some attention. Ah hah, that would be my next project! The one issue I had with the Erickson was the handlebars. The Erickson was built-up with the Campy Centaur compact triple group from Debbie’s now retired Ritchey Road Logic bike which is now hanging next to the Bianchi in my upstairs office closet. The problem I ran into but never addressed were the 38 cm wide handlebars, which were about 4 cm too narrow for me. Sadly, I just didn’t have any spare 42 cm wide drop bars sitting around and it didn’t seem worth pursuing as I was still working and not riding single bikes all that much. 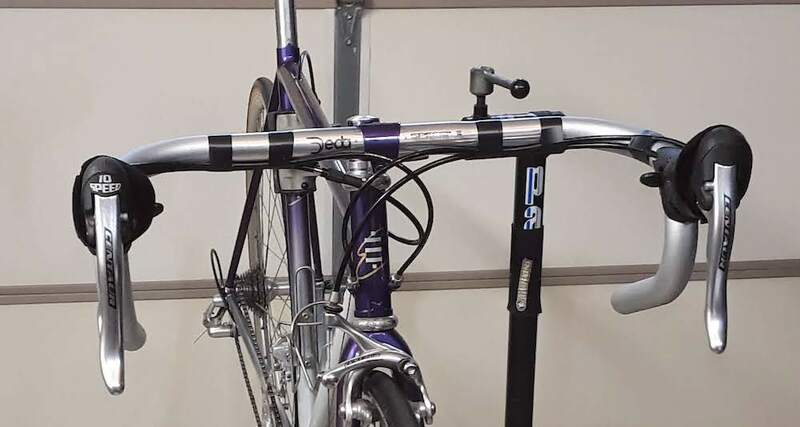 However, now that I find I’ll be riding alone during the winter months I had the motivation I needed so on Tuesday night I ordered an attractively-priced set of Deda Elementi / Tre Speciale bars for it. 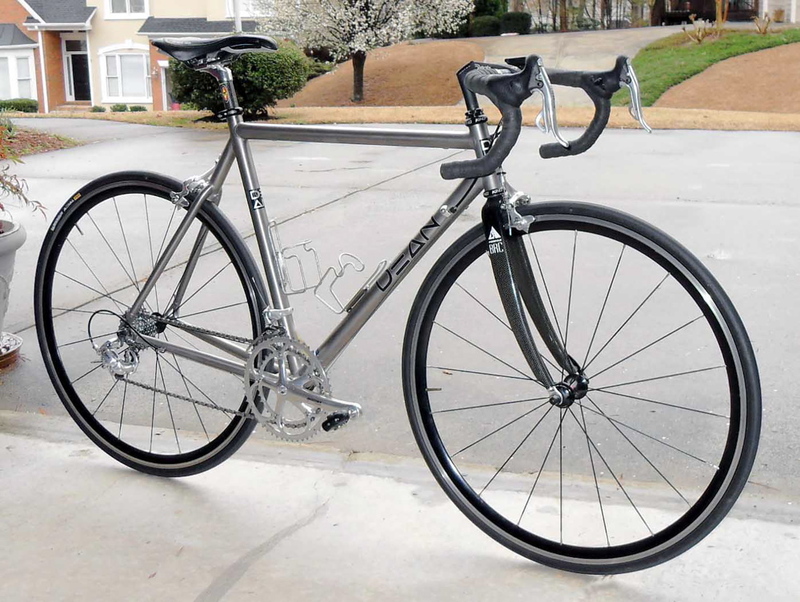 My plan is to use the Erickson with the 50/40/30 triple crankset and 13x29t cassette for climbing Kennesaw Mountain at least once a week over the winter. I’ve done it on my Calfee, but the 12% grades were a grind with the 50/36 compact drive and 13x26t cassette on the Calfee. On Wednesday — and while waiting for the parts I needed to finish the Dean and Erickson — I began working my way through the two cabinets in the garage that hold most of my cycling parts and tools. I’d organized everything back in April 2009, but there was a lot “stuff” in those cabinets that was just too old and/or worn to be of use to me that either needed to go up on ebay or out with the recycling/trash. Amazingly, it took me the better part of Wednesday intermixed with some other errands to go through about half of the “stuff” in just one of the cabinets. On Thursday morning I resumed sorting through all of my cycling parts, tools, etc. I found it interesting as I went through the cabinets how many times I’d look at something and ask myself, “Do I really need to keep this?” I’d put it in the discard container, then pull it back out of the discard container and either set it aside as a potential keeper, move it to a growing stack of potential ebay items, or finally just put it back in the discard container. I truly am a pack rat when it comes to certain things, but ultimately a LOT of stuff went in the discard container, e.g., 20-year old two-way radios that still worked but where the rubber and plastic parts were crumbling, worn-out chain rings, cheap bottom brackets that had long-ago been replaced by good ones, partially worn shifter cables that I held onto for possible reuse, etc. In the ebay stack were older components that I have no use for, but by-golly I’ll bet there’s someone out there looking for that exact part! Well, maybe… I’ll list them once for nominal listing fee and ask for $5.00 shipping and handling and if someone wants to pay $5 for something, I’ll break even and feel better for not sending a potentially classic cycling component to the smelter. Thursday’s mail arrived around 10:00am and in it were the parts I needed to finish rebuilding the shifter on the Dean road bike. 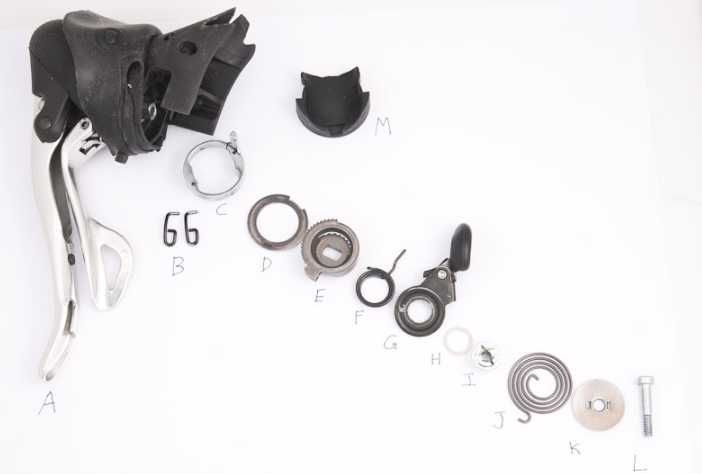 After making sufficient progress on my cycling cabinet project I was able to spend a few minutes later in the afternoon re-assembling the shifter with a new spring carrier, indexing springs and the return spring. Now, all I needed was for the rain to stop so I could go and ride. When I woke up on Friday I’d expected the rain to be gone so I could get out and ride the Dean; however, the soggy weather stayed with us well past noon. 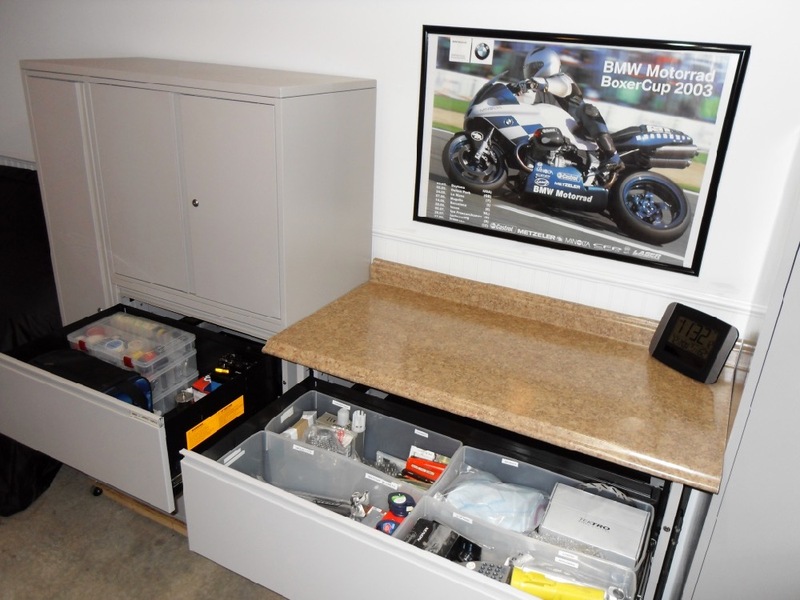 After doing some other things on my to-do list in the morning I headed back out to the garage to sort through a couple more drawers in the second cabinet then turned my attention back to the Dean sitting up against my cycling work bench. Having now mentally cataloged all of the extra bicycle parts I had on hand I decided to change-out the all-alloy Campy Chorus crankset for a Campy Chorus carbon crankset that was sitting unused as they’d just look better on the bike with their dark grey/black carbon crank arms. Both sets used conventional 53/39 gearing so no change there. It will be interesting to ride this bike with its conventional crank gearing and the 12×25 cassette vs. the Calfee with its 50/36 and 13×26 cassette. As it sits it weighs 19.3 lbs with its somewhat heavy Mavic Cosmic wheelset, 1.3 lbs heavier than the 18.0 lb Calfee Tetra Pro. Of course, one thing leads to another and as I worked on the bike I realized I really needed to change out the rear derailleur’s shifter housing and cable to eliminate some binding. So, as usual, a 15-minute task — changing the cranks — turned into an hour-long project. In fact, it was just long enough for Friday’s mail to arrive which included the new set of handlebars Erickson which I honestly didn’t expect to see until next week. 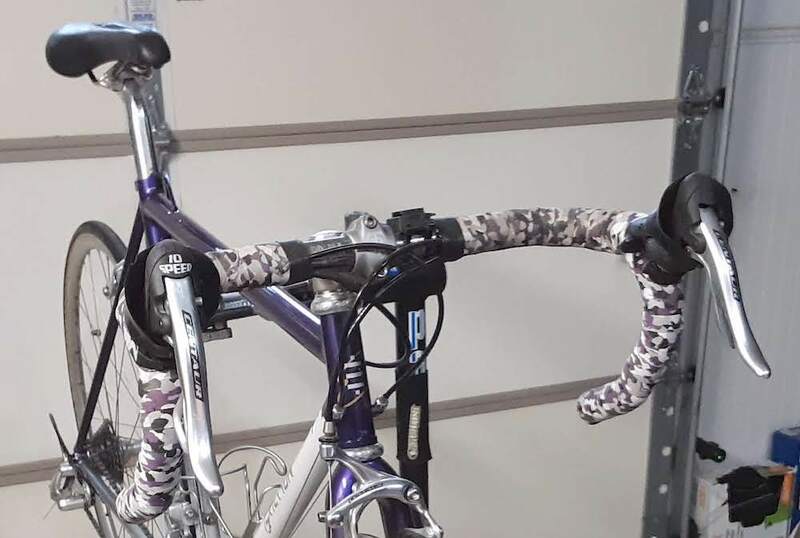 Like the Dean project, the Erickson handlebar replacement turned into a cable and housing update, remembering the Erickson was built-up from components I removed from Debbie’s Ritchey Road Logic after I upgraded her to a Calfee Luna several years back. I was able to get the Erickson all sorted-out and everything works. 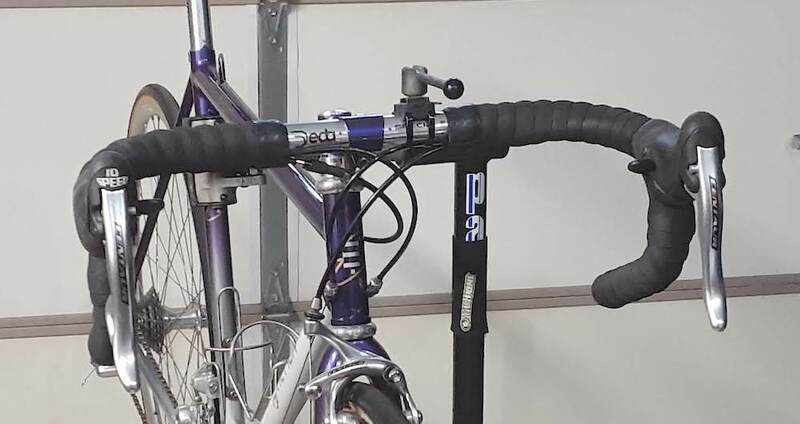 However, I discovered I need to figure out how to raise the handlebars without replacing the fork and it really needs a new saddle: the one on it is worn-out and falling apart after 20 years and a few thousand miles of riding between 1999 and 2005. So, a new saddle is coming along with an 80mm tall Soma Crane stem with an 80mm reach & 17° rise that ‘should’ yield the 30mm to 40mm higher handlebar position I need for my more mature riding posture. 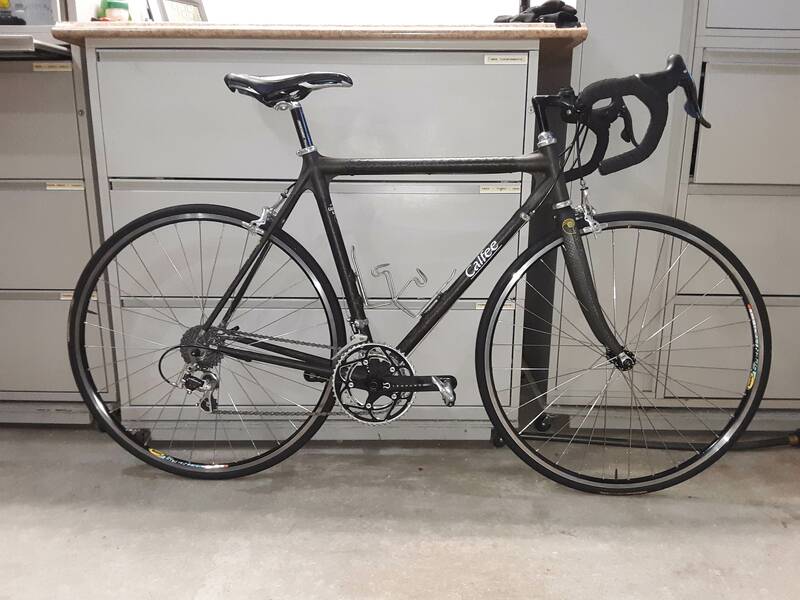 With that improved riding position and the 50/40/30 cranks with a 13x29t rear cassette I should be all set for Kennesaw Mountain. At 20.6 lbs as it sits, it’s the heaviest of the three solo road bikes, a full 2.6 lbs heavier than the Calfee at 18.0 lbs. I rode the Erickson on our short loop from the house on Saturday and the Calfee on the same loop Sunday just to so some back-to-back comparison riding. The Erickson definitely gets top marks for handling, but the Calfee still takes top honors for comfort, acceleration and planing. Its truly a sublime ride. Now, to be fair, my riding position on the Erickson was far too aggressive for an apples-to-apples comparison. Years ago, both the Calfee and the Dean were set up with the handlebars a good 3.0cm lower than they are today. Gotta love that about threaded steerers and quill stems: lots of adjustability without using spacers, different stems, etc. I hope to get out on the Dean Monday if the weather will permit. After that I’ll be consumed by a small repair project in the garage after discovering a small termite problem earlier this week. All I’ll say is, it could have been worse. Ugg. We have our pest control guy coming out tomorrow to do a refresh on the Sentricon system around our house. Somehow we decided not to have it updated back in 2014 and now I’m regretting that. Hopefully he won’t find any other evidence of infestations. But I digress…. As to why I have all three of these bikes? The year 2005 is when the Erickson was replaced as my every-day bicycle by the 1998 Dean, which was in turn replaced by the 1997 Calfee in 2007. In the past I’d sell off my old bikes when I bought a new one and I’ve lived to regret. 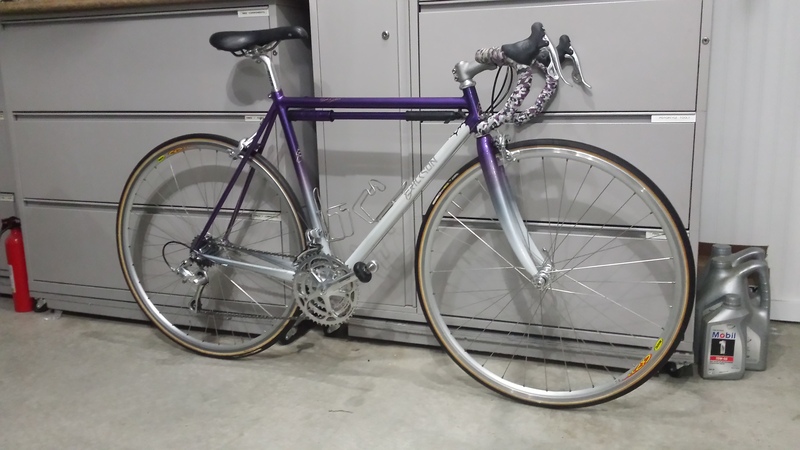 I had several Raleigh’s from the early 80’s that were really quite nice: a Grand Prix, a Prestige and a Custom. I also sent a really nice early 90’s Trek 2300 off to a new home. And then there are the tandems; the ’98 Cannondale MT3000 and both Erickson tandems. In fact,I know where the 1998 Erickson is and I’m good with that one having stayed “in the family” so to speak. However, I’d love to find our 2002 Erickson travel tandem and, if it’s not being used, buy it back so we’d have a “spare” tandem and, well, because it was really a very nice riding tandem, perhaps even a bit better handling than the 1998 model. So, if anyone has seen this white to carbon grey fade 2002 Erickson Custom travel tandem that we sold to a couple from Kentucky back in the fall of 2007, please let us know!! Interesting to read that your Calfee single has 50×36 chainrings, when standard compact is 50×34. Why the difference? I had to think back on that one as I believe I made the change back in 2004 on the Erickson. Looking back at my postings on BikeForums.net, I started off with 50/34 but found the jump from big to small to be a bit too severe for my preferences, always requiring at least one or two shifts on the cassette. The largest ring available for the compact drive was 36t and that proved to be better and that’s what I’ve stuck with. So, when I converted the Calfee over to compact drive back in 2009 with the Leopard cranks I found on close out, I just stuck with the 50/36 rings.